Frontline 2 bed apartment Fuzeta - Property for sale. Full Description: This spacious and attractive 2 bedroom Algarve Apartment is located in the picturesque fishing village of Fuzeta in Eastern Algarve. Situated on the edge of the Ria Formosa natural park the views are stunning over lagoons and beaches to the sea. The village boasts a daily fish market, waterfront cafes & restaurants and lovely sandy beaches. 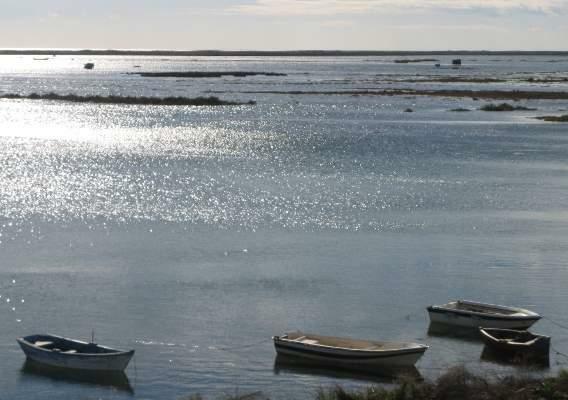 The calm waters of the lagoon are ideal for children and a 5 minute water taxi takes you to the Island of Armona with its miles of unspoilt beach. For the golfer there are a host of prestigious golf courses within a 20 minute radius. Faro airport is 25 minutes drive away. This 1st floor apartment has been personally and stylishly furnished to present top class accommodation. All mod cons have been incorporated to ensure stress free living. Beautifully decorated, the apartment comprises of 2 double bedrooms, one en-suite and a separate family bathroom. The spacious lounge/dining room with breakfast bar to the fully fitted kitchen extends to 2 large balconies, the 1st overlooking the pool and the 2nd with uninterrupted lagoon and sea views. Views of the Ria Formosa & the sea are not a distant glimpse, you can almost touch the water. This Algarve property is ideal as a holiday getaway or permanent home. With low maintenance & secure lock up you can completely relax, unwind and enjoy. Throw away the car keys & wander the narrow streets to find good food, great wine and friendly locals. There are very few ?true? frontline properties where nothing can ever spoil the view. This Algarve apartment is a rarity. An exceptional property on the doorstep of a beautiful and protected location.